Apple to announce iOS 8 and (possibly) the iWatch, join us for a liveblog of the WWDC keynote! Well, well, well, it's once again WWDC time! Yeah, yeah, we know it's mostly a developers' event, and this is why we won't be following and/or covering all the sessions and presentations that will be held during the next few days. What we're totally covering, though, is the keynote, which is going to kickstart the whole event and introduce us to some of the new projects that Apple is working on for 2014. What should we expect to see from Apple? While we can't say anything for sure, we do suspect we could see a a number of exciting things, including iOS 8, the rumored Healthbook app, and the Apple iWatch smartwatch, of which there have been some wild speculations, but never a solid piece of evidence thus far. Of course, getting to see some serious piece of new hardware, like the next-gen iPhones or iPads is pretty much out of the question, as the introductions of those are expected to happen a bit later, around the September-October time frame. Stay tuned to our liveblog of the WWDC keynote! We'll be keeping you updated as the event progresses, but of course, you're always free to also check out the live-stream of the event right here. 13:58 Thanks for tuning in, and stay with us at PhoneArena, because we have tons of intriguing iOS 8 coverage! 13:58 Tim also thanks the rest of the crew back in Cupertino for the great week. That's a wrap guys. 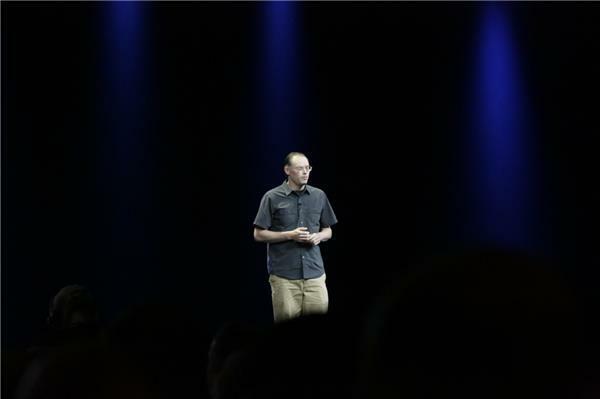 13:57 Tim asks everyone from the Apple team to stand up and receive a round of huge applause. 13:55 Tim Cook is back on stage. It looks like he's to wrap things up. 13:55 iOS 8 beta will be available to devs today. Everyone else will get it in the fall. 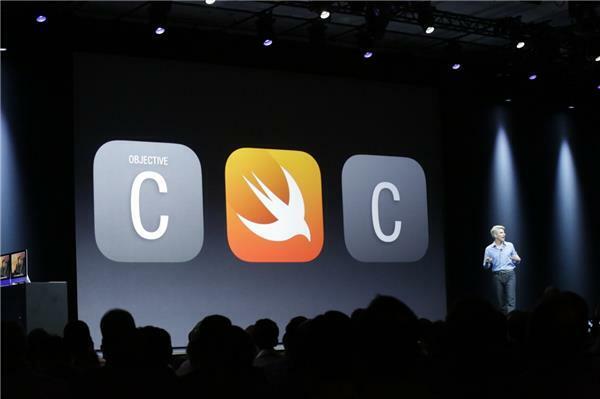 13:54 Developers will be able to submit apps written on Swift on day one of iOS 8's release. 13:49 We're now getting a demo of the new Swift programming language. 13:47 "Closures, Generics, Type interfaces, Namespaces - many modern features are coming to Swift. 13:46 Next up, Objective-C... Apple has a new programming language! "Swift": Fast, modern and safe! 13:45 SceneKit is here - a 3D scene rendered for casual games on iOS! 13:44 SpriteKit - iOS's kit for building 2D games gets improvements as well - light sources, per-pixel lighting an more. 13:43 We're getting a demo of the visual goodies made possible with Metal. 13:41 Tim Sweeney from Epic Games is on stage to talk up Metal. 13:40 Up to 10x graphics performance with Metal for developers. 13:40 Console engines, like EA's Frostbyte, will be possible on iOS 8! 13:40 Metal! A new graphics enhancement technology for iOS! 13:37 Garage doors, lights, music... all should, theoretically, be controllable by iOS 8... at some point in the future. 13:36 HomeKit functionality - here's your home automation functionality! 13:35 Touch ID will now be usable by third-party apps! And they will NOT have actual access to your fingerprint. 13:33 System-wide third-party keyboards are coming to iOS! OMG! 13:31 Extensibility is a really cool new under-the-hood feature, because it'll allow apps to "talk" and interact with each other. 13:29 Third-party apps will be able to place widgets inside the Notification Center! 13:28 Extensibility: App Store apps will be able to extend their services to other apps. 13:27 Over "4000 new developer APIs"
13:27 New App Store SDK release - biggest yet since the launch of the App Store. Sounds interesting! 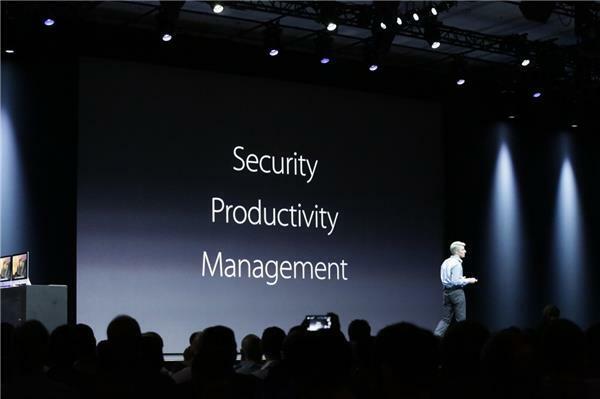 13:27 All new features outlined here will be available in the fall, said Tim Cook. 13:26 A new beta-test service is also coming - TestFlight. Devs can invite users to test their apps and get the results. 13:26 App bundles! Users can buy multiple apps at discounted prices with just a tap. App previews are also FINALLY coming. Video previews! 13:25 A new Explore tab in the App Store will be geared towards making app discovery easier. 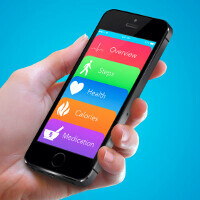 Just what we, app-junkies, needed! 13:24 Tim Cook is back on stage. He'll talk more about the developer side of things. 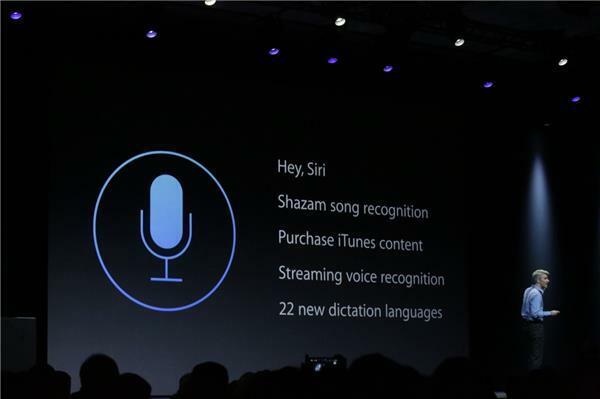 13:22 With iOS 8, you'll be able to say "Hey Siri", and it will activate Siri. It'll also be integrated with Shazam. 13:21 20 gigs of iCloud storage will soon cost just $0.99 a month. 13:19 Some great convergence demoed by Mr. Federighi. All changes done to photos on iPhone or iPad get automatically send to the other device. 13:17 Some more image editing tools come built into the Photos app, like levels. There's some pretty deep functionality baked in there. 13:16 A smarter search has been implemented with the new cloud-enabled Photos app, allowing you to easily find what you need. 13:15 Photos comes together with iCloud now. 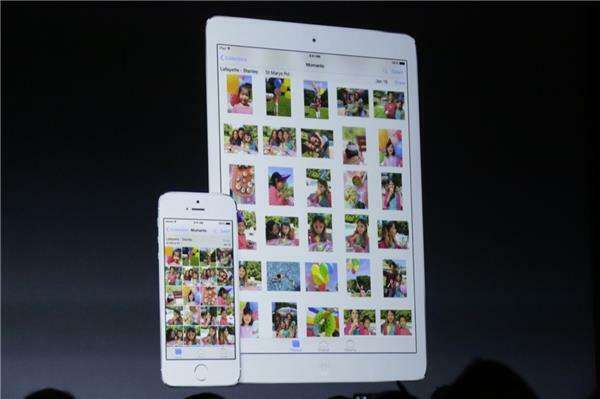 Every photo you take will be available on all your iCloud-enabled devices. 13:14 A new feature, Family Sharing, will let you have access to media purchases of your family members! Nice! 13:12 Mayo Clinic is on board as well. 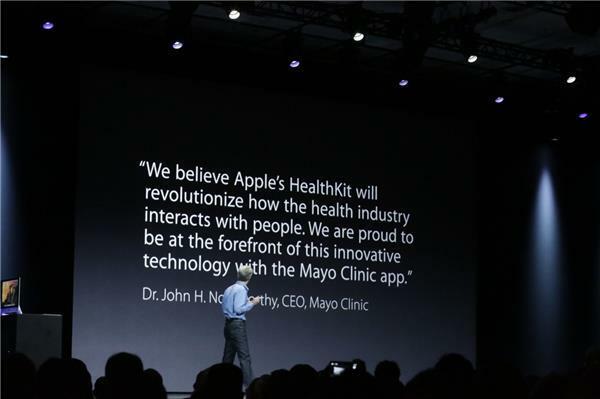 13:11 HealthKit comes with a new app: Health. This new combo will let you see all your health data in a single place. 13:10 OK, Health is the next topic of discussion here. "Developers have created a vast array of healthcare devices." 13:09 Craig talks up the device enrollment program for enterprises - making it easy for businesses to give iOS devices to employees. 13:07 According to Craig, this is because of the great enterprise-grade security and apps of iOS. 13:07 "98% of the Fortune 500 use iOS". 13:07 iCloud Drive is also coming to iOS, of course. It'll sync documents with your other computing devices. Free Apple branded Apple Juice. They invented it. And macintosh apples..they invented those as well. Ray, is there any staged clappers and shouters? Because I'm sure there is! Again, why does Apple always compare themselves to competitors during their conferences? I'd be willing to bet that 14% of Windows users is bigger than the entire Mac user base. Information is only beneficial when put into proper context. They're just envy against everyone. "Windows VS Apple" "Android VS Apple" "others charts VS Apple charts". They just can't deal with other companies doing better than them! I get the same from the comments about Chinese users switching from Android, the overall picture tells a much different story.